I’ve really tried challenging myself during these past few months and taking on tiny, tiny paper piecing squares was something I loved trying out. 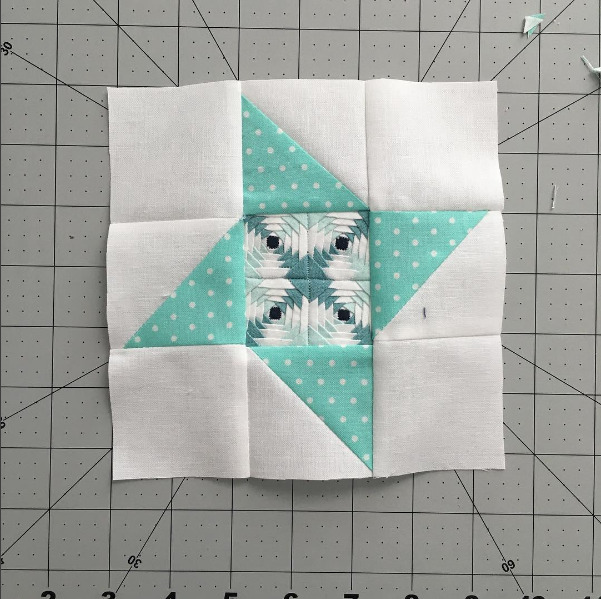 The center square measures just 2.5″ (2″ finished) and I loved every second of making it. I really wanted to find a #jensfillerblock that could highlight my pineapple center and that would add to it’s beauty. A traditional friendship star (or ninja star if you prefer) seemed like the perfect fit. Draw a line down the center of the 3 x 3″ white squares. Place on top of your 3 x 3″ print with the right sides together. Sew on both sides of the line 1/4″ away from the center. Cut down the line with your rotary cutter or scissors, press your squares open, and trim to 2.5″ x 2.5″. Lay out your block, assemble, press, and enjoy!